One of iTunes and iOS devices’ biggest “limitations” is how users cannot sync with multiple iTunes libraries. It is one of the biggest shocks iOS converts receive when they set up their device for the first time as they are used to simply copy-pasting files from their PC and onto their device. This isn’t very pleasant, but it forces the user to organize all their songs by placing them on one computer in iTunes. There are solutions to this, of course: you can manually add music to your device from iTunes but this isn’t exactly elegant. Keeping this in mind, a new app called MultiTunes has been developed and released for jailbroken iOS devices which lets users sync their iOS device with multiple iTunes libraries. Check it out after the jump! We’ve tested the app on an iPod touch 4G jailbroken on iOS 5.0.1 and confirm that it works as advertised. When you launch it for the first time via SpringBoard, it shows you your default iTunes library. 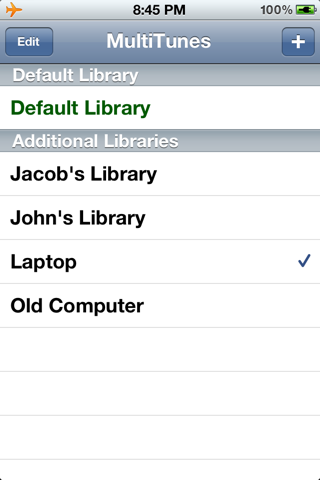 More libraries can be added using the + symbol on the top right. Whenever you connect your iOS device to a new PC with a new iTunes library, you can give the library a name and sync it with your device. This library will be synced without touching previously synced libraries. You can switch between libraries from the app, and the number of libraries you can sync to depends on how much free space you have on your device. MultiTunes can be downloaded for free from Cydia under Big Boss repository.